Working with multiple partners from Chicago and Toronto, including the Illinois Institute of Technology (IIT), The City of Chicago, and The City of Toronto, Cannon Design and ARUP, the IwB conducted a 4-day charrette working in South Chicago. 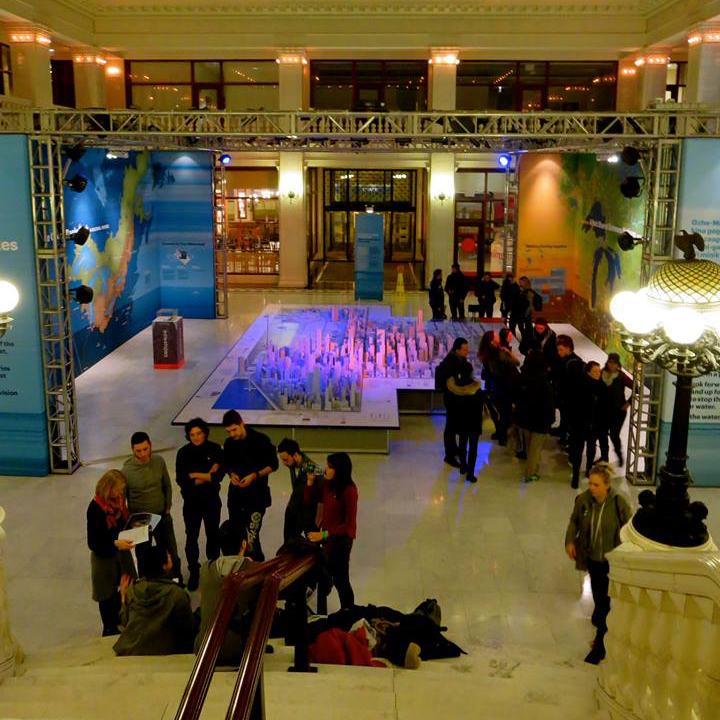 The Charrette was held in three locations: at the Chicago Institute of Technology Crown Hall building, the Cannon Design office on North Michigan Avenue, and the Chicago Architecture Foundation’s (CAF) historic Santa Fe/ Railway Exchange Building. Working with the theme of ‘activating resilient communities’, 5 teams of 10 international students, were asked to generate solutions for South Chicago neighbourhoods experiencing population decline and infrastructure deterioration. Charrette teams explored how to activate production and regain value in South Chicago neighbourhoods through community-based master planning initiatives. The results of the charrette produced on-the-ground proposals for neighbourhood infrastructural improvements and community empowerment strategies. Results were showcased in an exhibition in Chicago in April 2014. How do we create stability, value, and desire in a neighbourhood through community-centred master planning? The goal of the charrette was to create a series of implementable ideas that can be applied to ‘shrinking’ neighbourhoods in Chicago and in other cities in the United States and internationally. The Activating Resilient Communities Chicago Charrette drew from the understanding that the success of a resilient community builds on existing initiatives and leverages the skills and spirit of residents, non-profit organizations, entrepreneurs and government organizations to create new opportunities that ideally consider both local and regional issues. This definition of community resiliency strays from the traditional planning methodologies that are centred around a top-down professional and policy making approach. Instead, it takes a more organic approach that engages and empowers both high level policy and grassroots initiatives and plans for future resiliency on the neighbourhood scale. Chicago as a whole is not experiencing major population decline, but it is experiencing a serious ‘shrinking effect’ on the neighbourhood level. Several South Chicago neighbourhoods have seen significant population losses over the past few decades. For instance, Englewood and West Englewood, which in 1960 had approximately 100,000 residents are shown in 2000 census data to have population of roughly 40,000, and in 2010 data just 30,000 residents remaining. Similarly, the Washington Park population has declined rapidly from nearly 57,000 in 1950 to 14,146 in 2000. On average the neighbourhoods of Washington Park area, Englewood and West Englewood have seen a 63% decline in population when comparing 1950’s census numbers with those from 2010. Other South Chicago neighbourhoods have faced equally serious and rapid population shrinkage. Population shrinkage has had serious implications for the quality of life in South Chicago. In the 1950s and 1960s, these neighbourhoods were middle-class and presented a first opportunity for homeownership for many young families in Chicago. 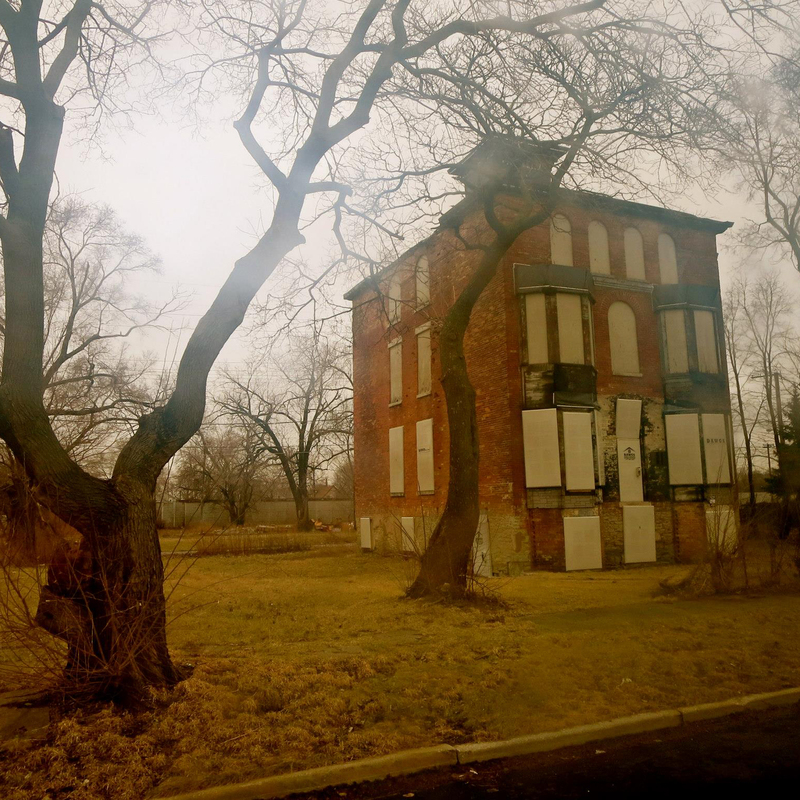 Today, the South Chicago area has been associated with poverty and urban blight. South Chicago has one of the highest rates of foreclosures in the city, which has left buildings vacant and has created ‘dead spaces’ throughout its neighbourhoods. According to RealtyTrac.com, 1 out of every 151 homes in West Englewood was foreclosed in March 2012, the highest rate in the city. According to a study by Marshall Brown, an architect, urban planner and professor at the Illinois Institute of Technology, about 151 acres, or 35 percent of the developable land in the neighborhood is vacant (Chicago Business, Nov.2013). In addition to the decrease in population, of those who still live in the neighbourhood, 1 in 4 are said to be unemployed and 44% live below the poverty line and census data revealed that annual income per capita was $12,255, which in part accounts for the the fact that the area also has some of the highest concentration of public housing in the United States (Time Magazine). The population shrinkage has had serious implications on local amenities like food distribution and production as well as access to education and health care. Englewood and West Englewood have been included in the districts Mayor Rahm Emanuel has described as ‘food deserts’, geographic areas where affordable and healthy food is difficult to obtain (Chicago Tribune, Aug. 2013). Similarly, support for the education infrastructure that was constructed for the communities of South Chicago has weaned because utilization of elementary and secondary schools has declined in many areas as a direct result of population exodus. The educational changes alone are striking. In 2013, the Chicago Public School Board (CPS) approved a number of school closures in what was declared, “the largest school closure in Chicago history” (Chicago Tribune, May 2013). The Chicago Public Schools Commission on School Utilization recently recommended the school district close up to 80 elementary schools in a 12-to-24 month period. In total, there were 49 school closures across Chicago that aimed to combat a massive budget deficit and allow the district to distribute scarce resources more efficiently. These school closures and consolidations will impact more than 50,000 children between the ages of 5 and 13, resulting in the destruction of 2,595 classrooms, most of which are located in low-income communities. In the context of the serious social, economic, and environmental effects of population shrinkage in Chicago, the Activating Resilient Communities Chicago Charrette emerged as part of the City of Chicago’s strategy to combat these issues and take a proactive stance to build resilient communities. Working with the IwB, the City of Chicago identified several shrinking neighbourhoods from its 2020 Green Healthy Neighbourhood Strategy report: Englewood, West Englewood, and Woodlawn. Along with the sites, and with the IwB’s assistance, the city also identified themes for investigation on the sites: Urban Agriculture (Vacant Lots), Art & Craft (Cultural Nodes), Advanced Manufacturing (Abandoned Institutions), Health & Wellness (Highway & Rail Buffer Zones), and Local Services (Main Streets). The Charrette focused on defining and instituting resilient communities in South Chicago. Teams looked at a particular site, theme, and typology to create scalable solutions that are rooted in grassroots initiatives already at play in the area to activate and empower South Chicago communities. The charrette worked with the definition of a resilient community as one that responds to, withstands, or recovers from adverse situations. This definition looks at growth from a holistic point of view, and positions itself to improve social, economic, and environmental conditions for local residents and the greater region. Here, resiliency can be defined as a measure of the sustained ability of the community to utilize available resources to address local and immediate needs. 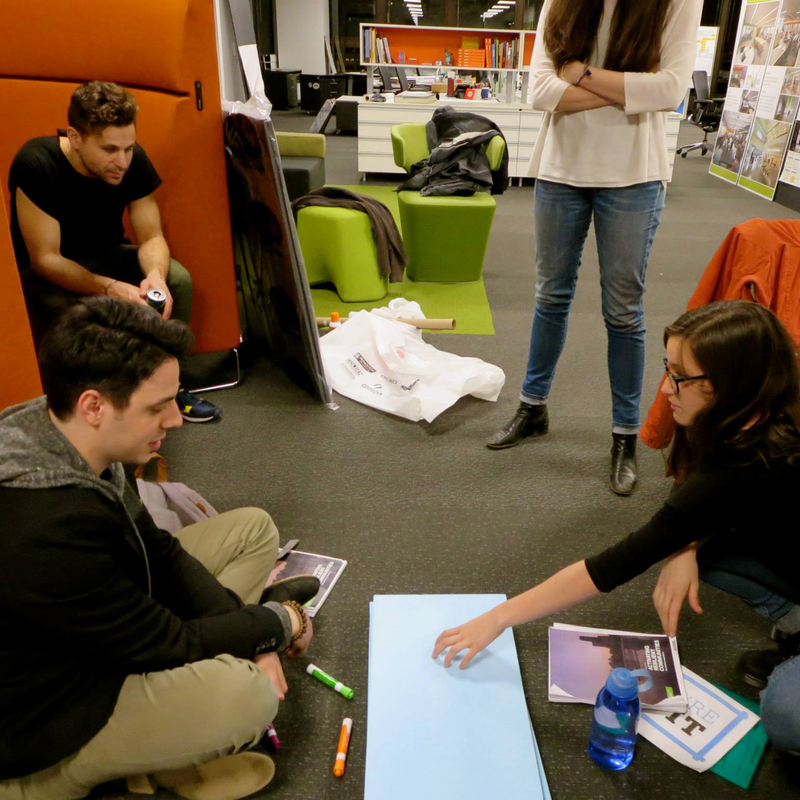 Working in multidisciplinary, international teams, charrette participants created productive communities through the lens of five key themes that were developed in consultation with IIT and the City of Chicago. The final presentations are available below. Teams were responsible for a list of deliverables, including but not exclusive to: a detailed existing and future site plan, a design of a physical intervention on the assigned site, a systems and design timeline for change (a detailed timeline that showed how the proposal would unfold), as well as a conceptual 3-D sculpture (a physical model that captured the spirit of the proposal). Team 1 proposed “South Side Grown”, a plan to use urban agriculture to activate positive change in South Chicago’s vacant lots. The proposal included a series of phased interventions on the case study lot. Projects included: modular green house units that could be used on a small scale, by individuals, or utilized for industrial purposes; healthy eating, wellness programming and farmers markets for the community; and various social media interventions to rebrand the neighbourhood. The proposal aimed to “bring the neighbourhood back to the city, and bring the city into the neighbourhood” through a phased plan that developed the sites from 2015 to 2014, significantly changing the image of South Chicago empty lots into self-sustaining urban farms and local food production networks. To view the complete project presentation click here. Team 2 proposed the “Art Loop Program”, a master plan for the Washington Park Community site that weaves a loop through vacant areas of the neighbourhood, connecting and activating the site through ongoing art programming. In an area of little density, few people and a lack of a sense of place, Team 2 proposes a plan for new public space, art and community building services, and special event spaces. Team 3 had the task of making a proposal to redevelop an abandoned school in Englewood, South Chicago. In Englewood alone, 7 schools have recently been closed. Team 3 uses the abandoned infrastructure as a potential site for local manufacturing called “Community Made Chicago”, a processing and education centre that moves manufacturing back to the local level. Focussed on the potential of the former Englewood Public School as a new manufacturing site, the proposal presents a network of maker hubs that combine manufacturing and education, turning the school into a hub that is a processing centre for medicinal packaging, bicycle and home renovation parts, and training of employees from the community. Team 4 created a resident driven system that promotes recreation and wellness in a safe environment through different activities spaced throughout the community. This system is called “Rooms to Grow” and proposes a proactive plan and design for the ‘nothing’ spaces that have been created over time in Englewood. Team 4 makes new area connections via the divided spaces in the neighbourhood by integrating and intersecting with existing elements in the surrounding space. The vacant land is repurposed into recreation and health and wellness areas for play, small business and public gatherings. Modular shapes, termed ‘rooms’ allow for small/individual use areas as well as new areas that can meet the needs of the whole community. The complete project presentation is coming soon. Team 5 proposed “Stroll 63rd”, a series of infrastructural and programming initiatives to activate the Main Street of Englewood, a 1 mile long street located between the West Englewood and Englewood subway stops; the site lacks basic amenities and street life and has many vacant spaces. Team 5 proposes a series of modular benches, light fixtures and other basic street furniture and infrastructure as well as modular units for possible small businesses start ups. The proposal creates plug and play elements that can activate the street, and “Turn this Main Street from a through place to a to place”. To see the complete project presentation click here.